As Christmas gets closer everyone always wonders if we are going to get the proverbial white Christmas. Unfortunately, if you look at Denver and Thornton weather history, the chances aren't all that good but it also depends on what you define as a white Christmas. Based on 1981 to 2010 normals, December ranks as only the third snowiest month in Denver (behind March and November). During that period we averaged 8.5 inches for the month. If a white Christmas means having more than an inch of snow on the ground on Christmas Day, then the chances are about 38%. Since 1900, a mere 45 Christmas Days have had snow on the ground. But, if you think a white Christmas means actually having measurable snowfall (at least 0.1 inch) on the holiday itself, then the odds drop down to only 15%! Only 20 Christmas Days since 1882 have had the white stuff actually fall on that day. Recent history though does offer slightly better chances. Over the past 30 years we have seen measurable snowfall on Chirstmas Day seven times or 23% of the time. We have also had at at least 1 inch of snow on the ground on Christmas Day during that period 16 times or 53% of the time. Having said all of that, there have been some pretty significant snow events around Christmas. The Christmas Eve blizzard of 1982 gave us the most snow ever on the ground for a Christmas Day with 24 inches! Christmas Day itself that year though saw a mere 0.2 inches of new snowfall but we werent too disappointed about that as we spent the holiday just trying to dig out from Christmas Eves snowfall! Some other significant Christmas Day snow depths were: 19 inches in 1913; 11 inches in 1918; and 12 inches in 1973 and 15 inches in 2006. The heaviest snowfall on Christmas Day itself was 7.8 inches which occurred in 2007 and the second most was 6.2 inches recorded in 1894. Will we have a white Christmas this year? Check the latest forecast to find out. It was quite a cold holiday and one with snow on the ground. Snow fell on the evening of 23rd into the early morning hours of the 24th. Thornton received 3.5 inches total while Denver officially recorded 2.3 inches. Christmas Day itself had the snow on the ground and temperatures were quite cold with Thornton seeing a low of 8.1 degrees and a high temperature of only 22.1 degrees. Denver saw a low of 2 degrees and a high of 19 degrees. A cool and blustery Christmas holiday. A passing storm system did not bring much in the way of snow but it did bring blustery winds. Denver International Airport measured a trace of snow while here in Thornton we recorded 0.1 inch. Back to back white Christmases which is rare in itself but it was also the first time that snowfall exceeded 1 inch on consecutive Christmas Days. We saw some light snow around noon but then things picked up in the late afternoon and evening. Thornton received 3.7 inches on the holiday. Out at the airport, Denver recorded 2.3 inches. A truly white Christmas although we had to wait until late in the day. Christmas Day started mild, dry and calm. By the late afternoon snow had begun to fall and 3.1 inches had accumulated in Thornton by midnight with another 2.2 inches coming on the 26th. At DIA, 3.4 inches was recorded on the holiday with an additional 4.4 inches the day after. A dry, seasonal day in the Mile High City. No snow was recorded or on the ground and temperatures were right near average for the date. A storm system brought a white, very cold Christmas to the Mile High City. Light snow began falling after dark on Christmas Eve and didn't end until before sunrise on Christmas Day. Denver officially recorded 2.6 inches of snow with a snow depth of 2.0 inches. Snow was recorded across much of the metro area with most receiving between 2 and 4 inches. Thornton was at the low end of that range as we recorded 1.9 inches. Six of the previous seven Christmases had at least 1 inch of snow on the ground, something that last happened from 1987 to 1993. In terms of temperatures, Denver recorded a high of only 16 degrees on Christmas Day making it the third coldest on record. Thornton was only slightly warmer with a high of 17 degrees. While no snow actually fell on Christmas Eve or Christmas Day in 2011, there was snow on the ground courtesy of a snowstorm in the days leading up to the holiday. The Mile High City received 7.3" of snow from a storm that arrived on the evening of December 21 and ended on the 22nd. Thornton fared better than Denver's totals as we recorded 9.1" over the two days. The foothills saw a bounty of snow with totals from 18 to 36 inches. On Christmas Day DIA reported 3 inches of snow left on the ground with a high of 35 degrees and a low of 19 degrees (Thornton saw a 42 degree high and a low of 14 degrees). The National Weather Service notes that there has been at least 1 inch of snow on the ground on Christmas Day in five out of the last six years. The last time that happened was from 1988 to 1993. Christmas 2010 was a mild and dry one as the mercury climbed to 45 degrees on Christmas Eve and 52 degrees on Christmas Day. Thornton saw similar temperatures of 46 degrees and 51 degrees. No measureable snow had been recorded during the month up to that point and that continued until the 30th. Christmas 2009 was a white Christmas by most standards. Snow began falling on the 22nd and lasted through the 26th totaling 7.8 inches over that time frame. Most of that, 4.9 inches, fell on the 23rd while only a trace was recorded on Christmas Day. The snow reached a maximum depth of 5 inches on Christmas Eve but by Christmas Day this dropped to 3 inches. This marked the fourth Christmas Day in a row with measurable snow on the ground. Temperatures on Christmas Day were quite chilly as a high temperature of only 24 degrees was seen and the mercury hit a low of -1. Overall December 2009 was a cold and snowy month. A total of 11.1 inches was recorded, 2.4 inches above normal, and the average monthly temperature was 24.1 degrees, 6.2 degrees below normal. Thornton's totals around the holiday were similar to the official Denver International Airport measurements but we did end the month with more overall - 15.3 inches. 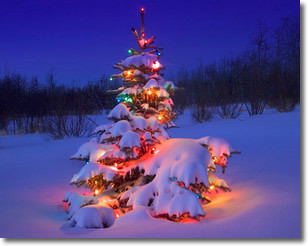 For a look at some great pictures taken around Eastlake on Christmas Eve 2009 click here. A rather mild day was the highlight of Christmas Day 2008. Denver officially reached a high temperature of 48 degrees that day – five degrees above normal. Thornton fared even better with a high temperature of 53 degrees. While no snow fell on the day, it was a white Christmas in that there was still one inch of snow on the ground from previous snows. Denver officially recorded 10.3 inches of snow which was 1.7 inches above normal. Thornton had a bit more with 12 inches of snow for the month. Between Christmas Day and December 27th, Denver was struck with two major winter snow storms that combined to push December 2007 into the 6th snowiest Denver December on record. On Christmas Day itself, Denver recorded 7.8 inches setting a record for Christmas Day snow since Denver began keeping records in 1882. The previous record was 6.2 inches set in 1894. Thornton didn't receive near as much however recording only 3.6 inches on the day last year. Officially Denver received 20.9 inches of snow in December 2007 as it set the 6th place record. Thornton recorded 17.9 inches for the month. The most December snowfall ever was 57.4 inches set in 1913 which is also the snowiest month ever recorded in the city. Christmas Day 2006 was definitely a white Christmas. In the days leading up to the holiday, we saw a major snowstorm on December 21st that dumped over 22 inches of snow in Thornton. This was coupled with cold days and extremely cold nights. On Christmas Day itself, just over 1/2 of an inch of snow fell. While the kids loved it, adults were less enthused and this began weeks of poor conditions for the Denver area. Eight more inches fell on the 29th and smaller accumulations fell in January all while maintaining frigid temperatures. Snow covered most yards and sidestreets for weeks! December 2006 became the third snowiest December on record and surprisingly, this was with only four days of measurable snowfall. It was warm and dry on Christmas Day 2005. Only 4.1 inches of snowfall was recorded for the entire month and that occurred near the beginning of the month. It was completely dry from December 21st through December 31st. The temperatures ranged from 69 to 35 degrees. Precipitation occurred on 3 days prior to Christmas (Tuesday 21 through Thursday 23) but no snow fell on Christmas Eve or on Christmas Day. But because temperatures on Wednesday and Thursday did not exceed the freezing mark and the low temperature on Christmas Eve (Friday) dropped to 2 degrees above zero...a white Christmas (Saturday) was enjoyed by Denverites. This in spite of the fact that the Christmas eve high jumped up to 46 degrees and Christmas Day had a high of 56 degrees and a low of 28. So for the record...Christmas Day 2004 was a white Christmas in spite of no snow falling on Christmas Eve or Christmas Day. It was dry and warm on Christmas Day 2003. A high temperature was 51 degrees and a low of 26. Absolutely no chance for any snow for Denver. There was some snow in the higher foothills and for the mountains west of Denver but by the time the atmosphere moved out over the Denver metro area...the air had dried out enough to only allow for a few mid and high level clouds. It was again cold enough to snow but there was very little...if any...moisture available to convert into snow. In fact...during the entire month of December...only a trace of snow was recorded...on the 6th and again on the 19th. It was a very dry month to end what became the driest year in Denver weather history. The high and low temperatures on Christmas Day last year were 36 and 11 degrees respectively. Another cool Christmas Day...however there was very little moisture in atmosphere surrounding Denver. It did snow on the 22nd...0.6 inch...but clear skies on Saint Nick day eliminated any chance of snow. There was a trace of snow left on the ground left over from the dusting that occurred on the 22nd. Temperatures for Christmas Day 2001 ranged from a high of 38 down to a low of 20 degrees. The high temperature on Christmas Day averages 43.8 degrees and a low of 18.2 degrees. Records for the date range from a high of 69 degrees recorded in 2005 down to a low of -10 degrees in 1983. In terms of snowfall, the most ever received on the holiday was 7.8 inches in 2007. The greatest snow depth was 24 inches in 1982. The following is a list of years going back to 1882 that includes Snow Depth, Snowfall along with Highs and Lows for each Christmas Day. Snow Depth is not available prior to 1900.